Today, I'm reading Tammy L. Gray's My Hope Next Door and I'm liking this small-town drama so far. Enjoy the peek into its pages! First Line: The Fairfield water tower loomed over Katie's regrets like a guard she had to sneak past. From Page 56: There was enough pot roast, potatoes, green beans, and coleslaw to feed an army, but he was more than ready to help polish it off. Hi Hallie! 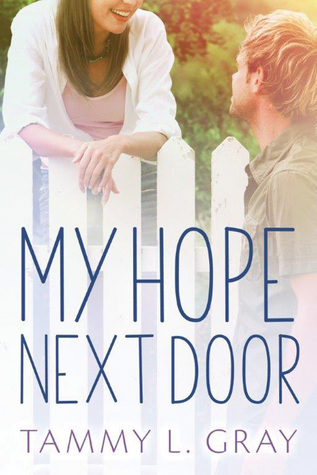 I really enjoyed My Hope Next Door and the second book in the series as well! Happy reading! Leanna McKee pushed her hat by its brim, hiding her face as best she could. Cute cover! Happy Friday Hallie! Happy Friday! I'm featuring The Maid of Fairbourne Hall by Julie Klassen on my blog. But I will share the first line of Jody Hedlund's Love Unexpected here. "The blast of a gunshot awoke Emma Chambers." That sounds like a neat book! I'm sharing two first lines on my blog (because I'm featuring a dual-novella book), but for commenting, my first line comes from the book I'm currently reading: "Giver of Wonder" by Roseanna White. "She would die today, one way or another." So many books involve food that makes my mouth water! My current first line is from A MOTHER IN THE MAKING by Gabrielle Meyer: "John Orton stared at Anna's portrait, his grief nothing compared to his pulsing guilt." "An eerie foreboding had jolted me from my sleep this morning, vexing my spirit - the kind of vexing that made me want to cower under my covers and stay in bed."